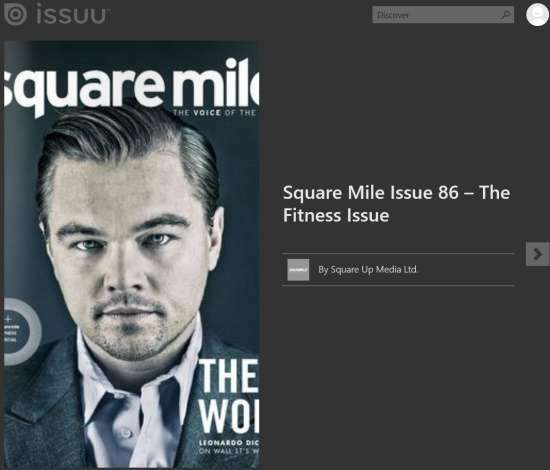 Issuu is a free magazine app for Windows 8 which lets you read free magazines. This app has millions of free magazines in its collection. You can read any magazine either by searching for it using the built-in search box or by going through each magazine. 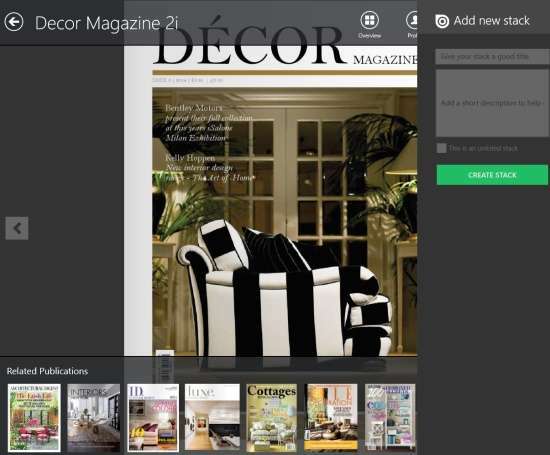 This free magazines app for Windows 8 has magazines in different categories: Design, Business, Art, Crafts, Fashion, Lifestyle, Tying The Knots, etc. Each category contains many magazines. Every magazine is nicely displayed and you will be able to read each magazine easily. 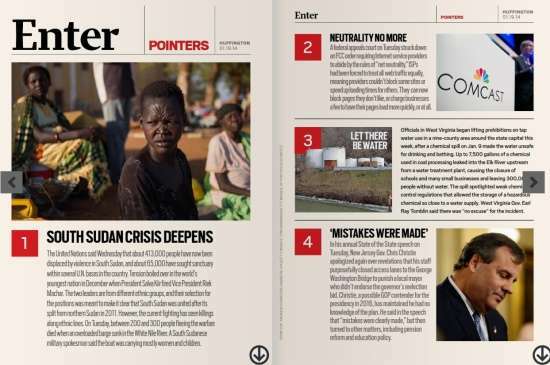 This magazine app even lets you share the magazines using your preferred network. You can create stacks of favorite magazines so that you can read them later. This app also recommends some magazines as per your selection. All the magazines in this app are completely free. You don’t need to subscribe or pay any buck for the magazines. The only thing that you need to do is sign up to create a free account. You can get Issuu magazine app free from Windows store by using the link given at the end of this review. After launching the app, you will be asked to sign up. You can use your LinkedIn, Facebook, and Google account to sign up. After sign up, you will be directed to the home page of the app. You will find magazines under different categories: Recently Read, Feed, Explore, Suggested Stacks. Recently Read: As the name suggests, Recently Read contains the free magazines that you have read recently. It helps you to keep a track of the magazines that you have already read in the app. Feed: Feed contains some of the leading and most read magazines. Explore: Explore helps you to read magazines category wise. It contains many categories: Design, Business, Art, Crafts, Fashion, Lifestyle, Tying The Knots, Spring Catalogs, Bon Appetite, Great Reads, Learning, Home Sweet Home, Sports, Photography, Going Abroad, Men’s fashion, Learning Beautiful Products, Urban Identity, Food and Cooking, Science, etc. Suggested Stacks: This option suggests you magazines on the basis of your selected category, most read ones, leading magazines, and the emerging ones as well. Select any magazine as per your choice. If you can’t see any magazine on the screen, then you can even search for it using the search box. You will get relevant results. Click on a magazine to open and read it. You will find that each page of the magazine is nicely displayed. Click Next to read next magazine. On the bottom of every magazine you can see recommendations for you as per your selection. You can create stacks of magazines for your reference. To create a stack and to add magazines to the stack, right click anywhere on the magazine page. You will find a stack option. Click on stack option and add title and short description for the stack. You can create as many stacks as you want and can add unlimited magazines to them. You can check your stacked magazines by clicking on profile. Another good feature of this app is that it lets you share the magazine. 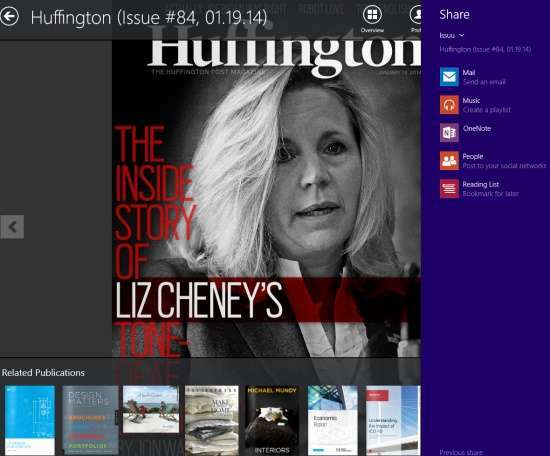 To share magazines, click on share option from the top panel and use your preferred social site to share. It sends a link of the magazine. The shared magazine can be accessed from anywhere using any device. 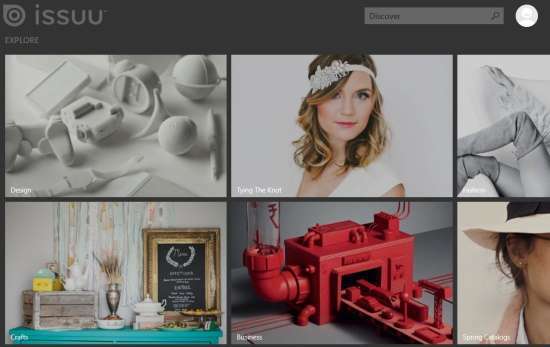 Also try Flipboard app for Windows 8. 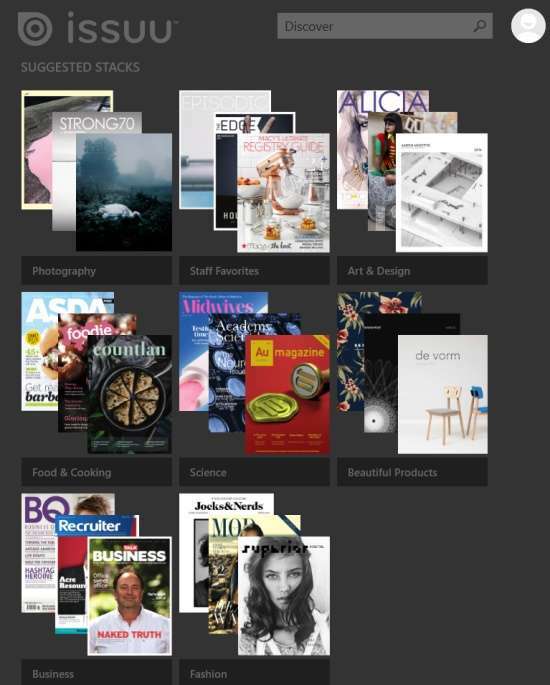 Issuu is on of the best magazine app to read free magazines for Windows 8. It has a collection of millions of completely free magazines. Search for your magazine and start reading without doing much. The app nicely displays the contents of every magazine. You can even save any magazine in stack to read it later or can even share it with anyone. 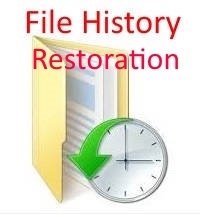 You will surely find this app to be useful.